Children from LBUSD's West Development Center presented Long Beach Rotary Club representatives with a token of appreciation for Rotary's donation of 3,200 books to local CDCs this year. Upon receiving the books, students each selected one to keep, writing their names in their chosen books with the help of Rotarians and CDC staff. 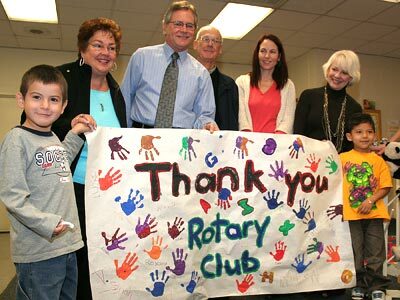 Long Beach Rotary also has donated more than 150,000 books to elementary schools here.